Maple & Friends: Burt's Bees for dogs! We spend a lot of time at the dog park and sometimes this can make Maple really really stinky! 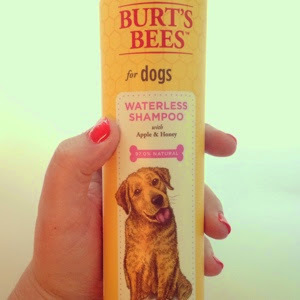 We can't give her a bath every time so we were ecstatic when we found this waterless shampoo from Burt's Bees! It's natural (made with apple and honey), it smells amazing and gets the job done. It has made our dog park experience much more enjoyable. Maple also has allergies and suffers from hot spots. If anyone has had a pet who suffers from allergies, you know the frustration. Burt's Bees makes a soothing hot spot spray with aloe vera and apple cider vinegar. It seems to be giving our sweet girl some relief from her itchy misery. 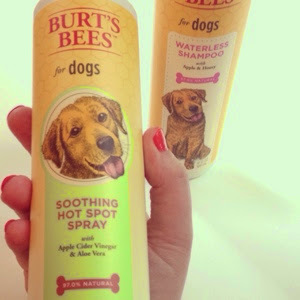 We have always loved Burt's Bees but now that we know they have dog products as well, we love them even more! They have many many more dog products available, including shampoo and conditioner, lotion for paws, and dental care!